AT LEAST they were consistent. From the opening encounter in the main stadium to the concluding match in the outback on Court 11, the story was the same. Five British players did battle on the first day of the Australian Open here yesterday and five left the fray without winning a set. Heather Watson and Laura Robson, the two brightest prospects in the British game, were swept aside by Victoria Azarenka and Jelena Jankovic, ranked No 3 and No 14 in the world respectively. Anne Keothavong, who had barely eaten for two days after going down with a stomach bug, retired after losing the first set to Germany's Mona Barthel, while James Ward lost in straight sets to Slovenia's Blaz Kavcic. If those matches went true to form - in each case the Britons lost to higher-ranked players - the biggest disappointment of the day was Elena Baltacha's defeat by France's StEphanie Foretz Gacon - ranked 53 places beneath her. British supporters were keeping fingers crossed that Andy Murray would prevent a clean sweep by beating Ryan Harrison in the early hours of this morning. The last time that six Britons lost in the first round of an overseas Grand Slam tournament was at the French Open in 1991. Nevertheless, a sense of perspective is necessary. The other side of the coin is that this was the first time for 20 years that six Britons had made the first round of a Grand Slam tournament other than Wimbledon. As Leon Smith, the head of men's and women's tennis at the Lawn Tennis Association, said, the next challenge for the players is "not just to qualify for the world's biggest tournaments but then go further in the competitions". The day had begun full of promise with Watson walking out on Rod Laver Arena for the first match of the opening Grand Slam tournament of the year. The 19-year-old from Guernsey won her opening service game and had chances to take a 2-0 lead before Azarenka took control. 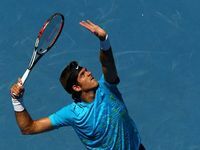 The Belarusian, who made a flying start to the season by winning the title in Sydney last week, barely missed a ball thereafter and won 6-1, 6-0. "That's why she's No 3 in the world," Watson said afterwards. "But I've got to put up a bigger fight than that to get close and I didn't today. I struggled with my serve a bit. I didn't feel like I had a high first-serve percentage. The first game was good and then from there it was just downhill." Robson's story was similar. After trailing 3-2 in the first set, the 2008 junior Wimbledon champion lost nine games in a row as Jankovic won 6-2, 6-0. The former world No 1, who is one of the best movers in the women's game, kept forcing her opponent into mistakes. "She just played better," Robson said. "I let her dictate the points. That's not the way I play and not the way I should have allowed myself to play." The match was played in Margaret Court Arena, which is named after one of Australia's greatest players, who caused controversy last week when she made public her opposition to gay marriages. There had been talk of protests - which never materialised - and Robson was sporting a rainbow-coloured hairband. "I wore it because I believe in equal rights for everyone," the 17-year-old said afterwards. "It's not a protest, it's just a hairband." The other three British defeats came out on Court 11, which is not the easiest of environments in which to play. Situated in a far-flung corner of Melbourne Park, the court has seating for barely 100 people and the players can be distracted by noise from adjoining courts and the railway lines just beyond the perimeter fence. On an increasingly hot day with a gusting wind, Ward never got to terms with the conditions. 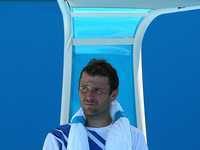 The world No 161, who, like Robson, won three matches in qualifying to make the main draw, was beaten 6-4, 6-3, 6-4 by Kavcic, the world No 103. "It was difficult out there due to the wind, but it was the same for both of us and there are no excuses," Ward said. Three years ago Keothavong lost in the first round here after feeling unwell as a result of taking too much liquid on board during the day. This time she was suffering from a bug which forced her to quit after she lost the first set 6-0. "I had a high temperature and a dodgy stomach," she said afterwards. "Apparently there is something going around. It's just unfortunate timing." Baltacha usually performs well here, but the British No 1 never looked comfortable and was beaten 6-2, 6-4 by Foretz Gacon. "For whatever reason I just couldn't get into the match at all," Baltacha said. "Something wasn't there. It's disappointing, it's frustrating, just one of those days." She added: "I think all the girls are disappointed, but it's the third week of the year - that's how I'm seeing it. It's the start of the year and that's it. This week's been hard for all of us, but you've got to keep going and move on." The four British women will next head for Israel, where they will play Britain's first Fed Cup match under the captaincy of Judy Murray. After that, battle will be joined in the fight to make the field for the Olympic Games at Wimbledon. A top 70 ranking should ensure qualification. Only Baltacha (world No 54) is currently ranked high enough, but Keothavong (73), Watson (105) and Robson (134) all believe they can make the grade by the cut-off date, which falls in early June.